You’ve often told us you’d like to connect with the people who cared for you. If you missed the opportunity to thank someone for the care you received, here’s your chance. Post and share your thanks on these two sites. For any caregiver please visit: Thank the People Who Care; and for a first responder visit: Thank a Paramedic. 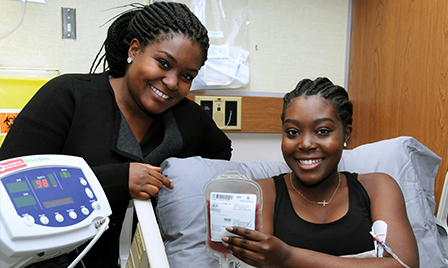 Sickle cell patient Revée Agyepong, right, poses just prior to her transplant of donated stem cells from her sister Stephanie Amoah. The Because You Cared video series provides a vehicle for Albertans to say thank you to AHS staff who make a significant difference in patients' lives. Watch fellow Albertans thank the people who helped them in a time of need. See all of the Because You Cared videos and stories.